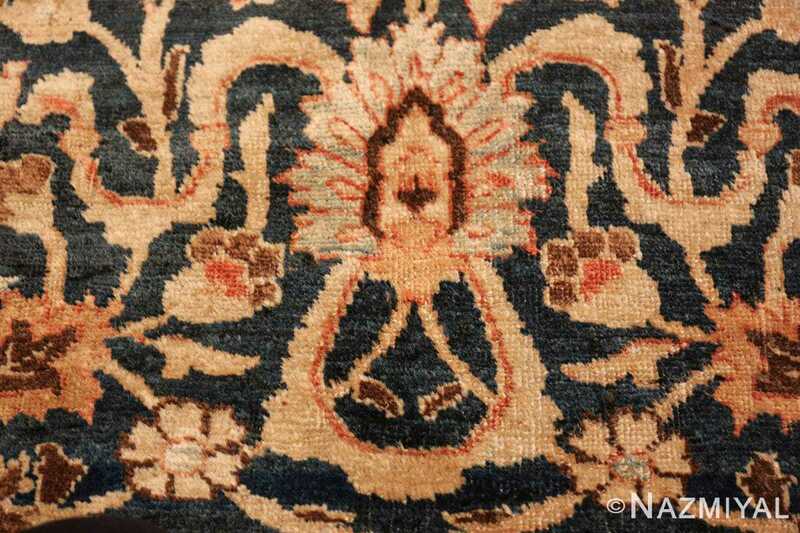 Beautiful Small Size Blue Background Antique Persian Tabriz Rug, Country of Origin / Rug Type: Persian Rug, Circa Date: 1920 – This marvelous antique Persian Tabriz rug is a small scatter size rug, but what it may lack in physical scale, it more than makes up for in sheer artistic beauty. 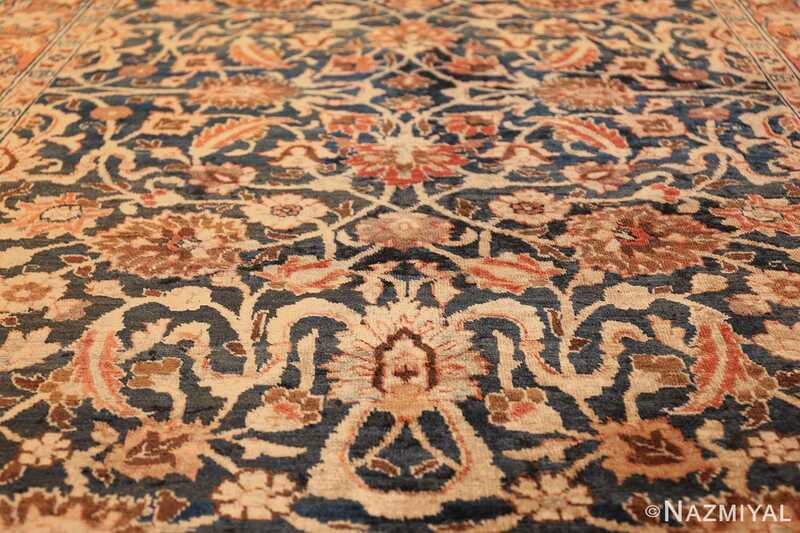 This magnificent blue background antique Persian Tabriz rug boasts rich hues of navy blue and rusty reds that are woven together in a fascinating and scrumptious fashion. 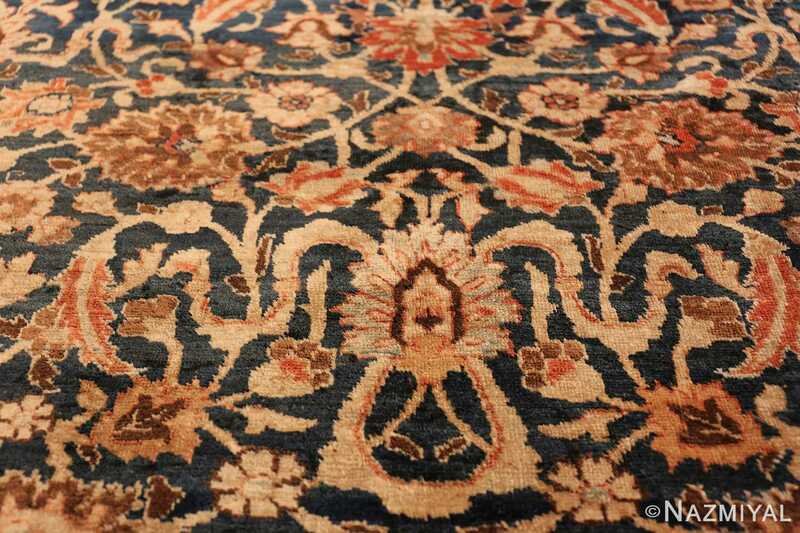 The central field displays an intriguing herati fish design of vines, leaves, and flowers. 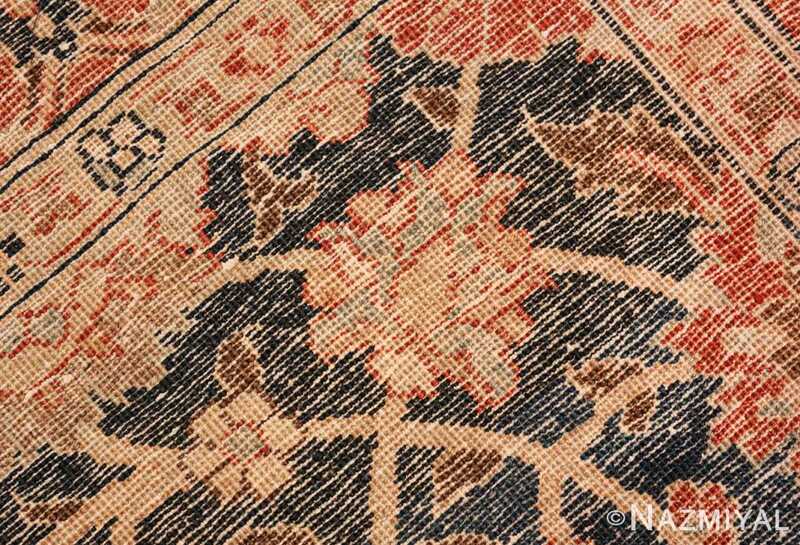 An elaborate border frame, which is based off of the same patterns we see in the field, completes the illustration with an intricate and symmetrical pattern of classic floral images. 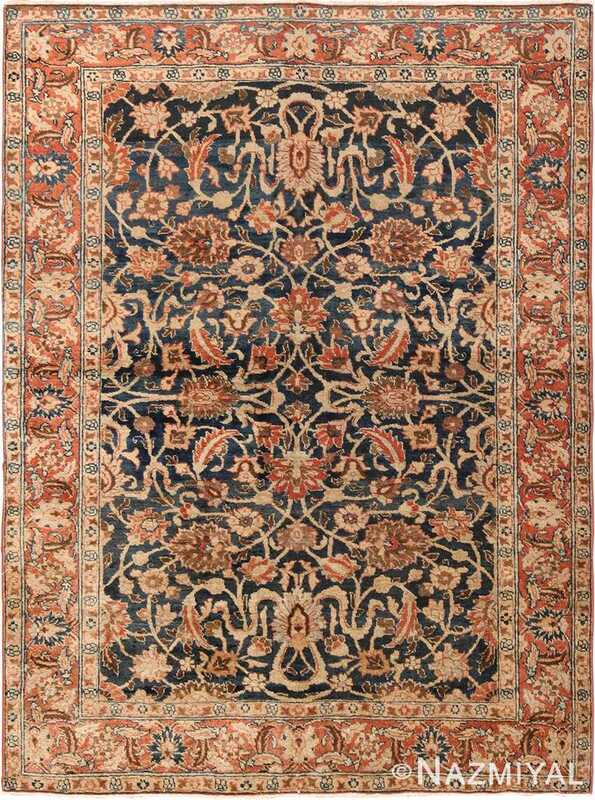 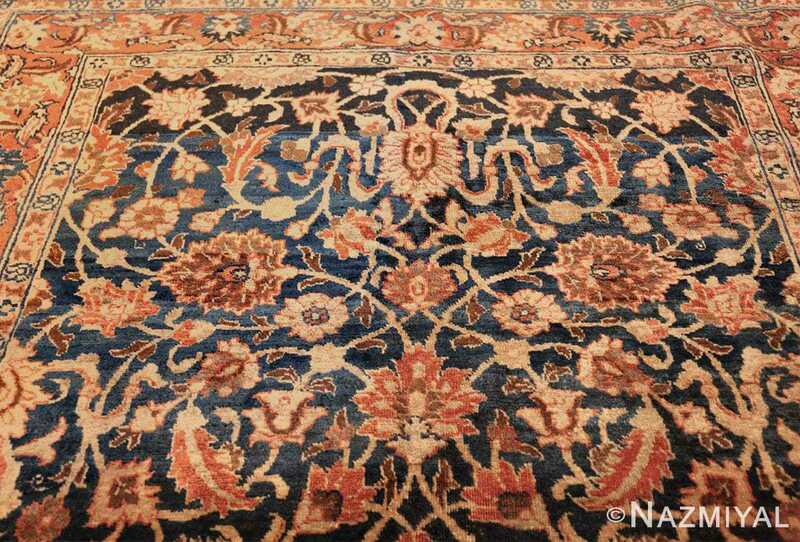 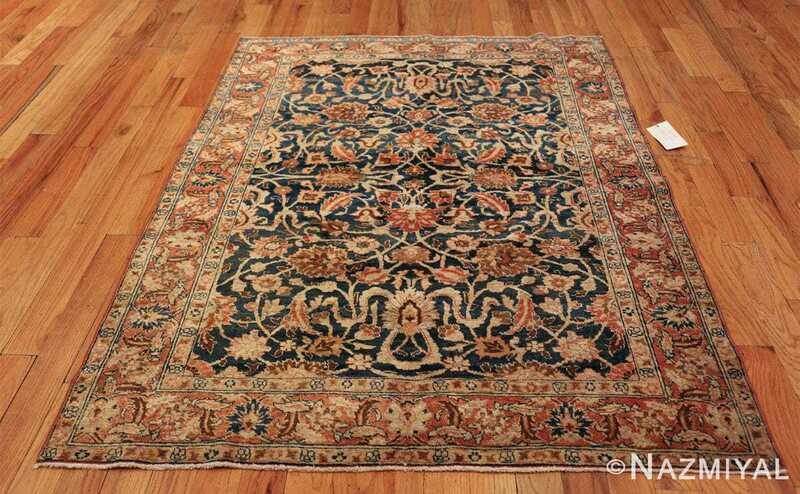 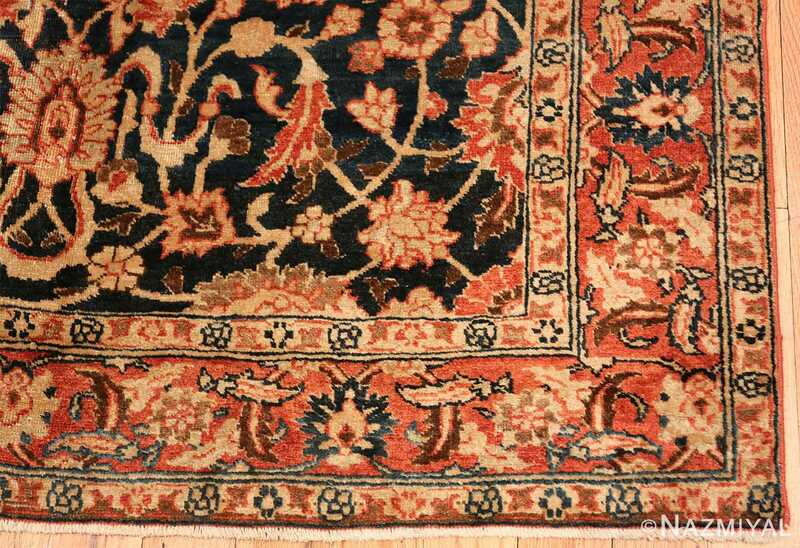 The central field of this antique Persian carpet comprises a rich navy blue background decorated with a fancifully rendered tapestry of pastel orange vines and leaves in varying shades of color from earthy tones of brown to vivid rusts and red hues. Exotic flowers in a myriad of styles are also scattered throughout the idyllic scene of this beautiful blue rug. 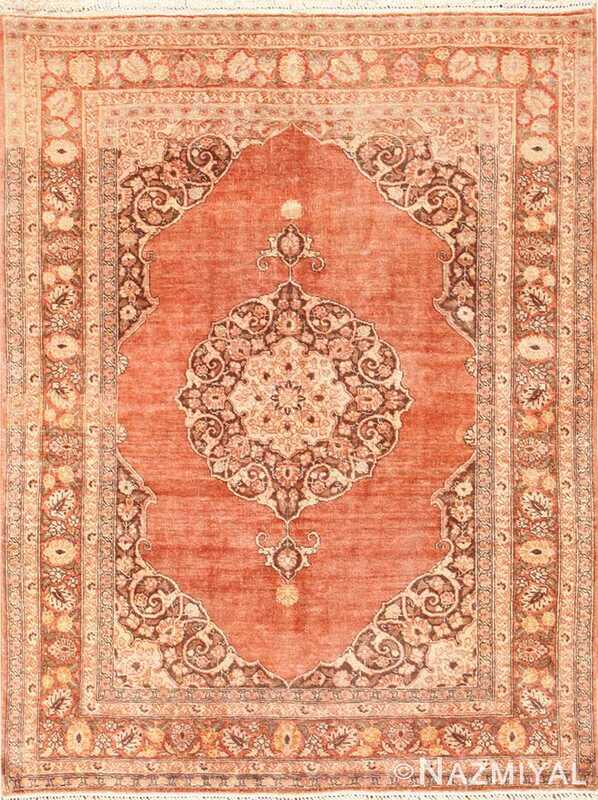 The center most patterns consists of a mirror images of two rusty red flowers, which are connected by a diamond shaped vine scroll formation. 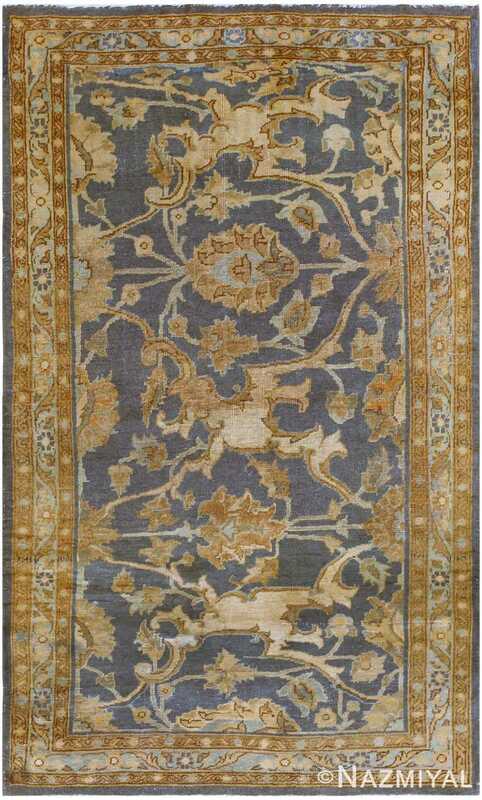 The entire illustration and design pattern of this rug is delightfully playful but also deliberately classic. 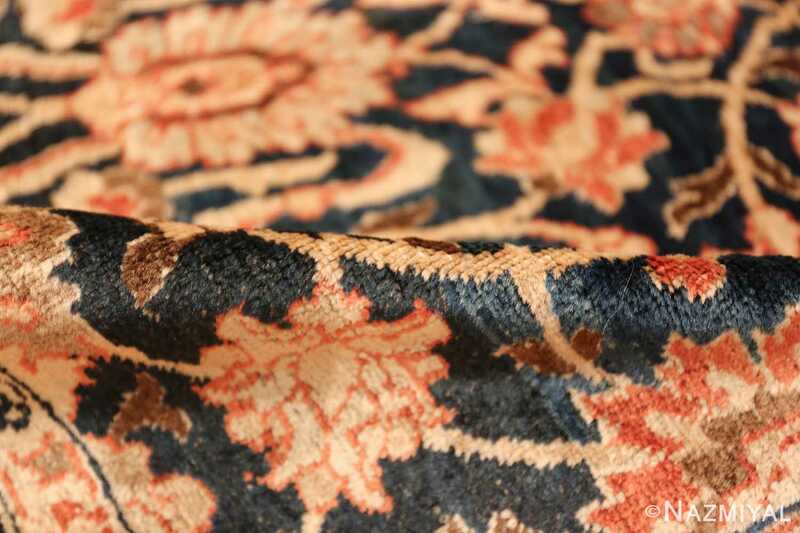 The border strand is a masterpiece in and of itself. With a stunningly lifelike display of leaves and flowers, which decorate a bold orange background this border could not have been more perfectly designed or colored. 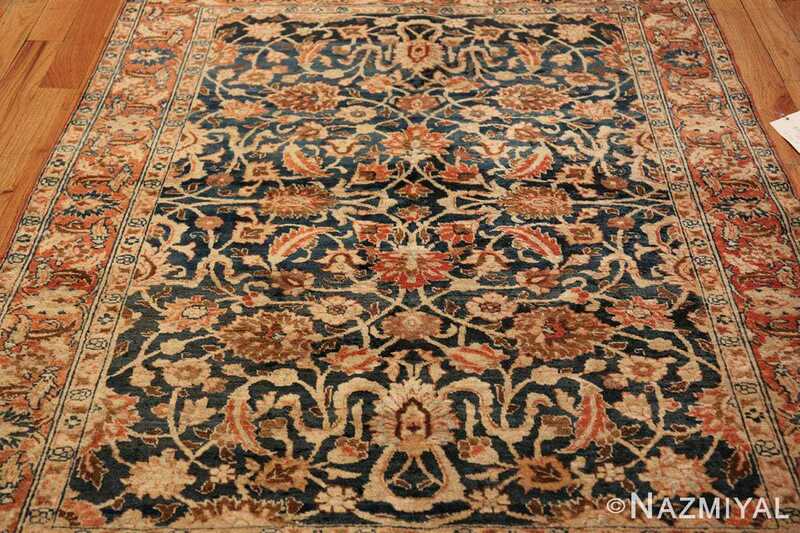 Navy blue flowers are precisely placed across the border, which is rich with images of pastel flowers, vine scrolls and leaves. This framing part of the antique carpet is softer in appearance. While the central field of this piece displays a stark contrast between the dark navy blue backdrop and its brilliant orange embellishments. Altogether, this small but glorious blue background antique Persian Tabriz rug displays a fresh and remarkable beauty that is rarely matched. 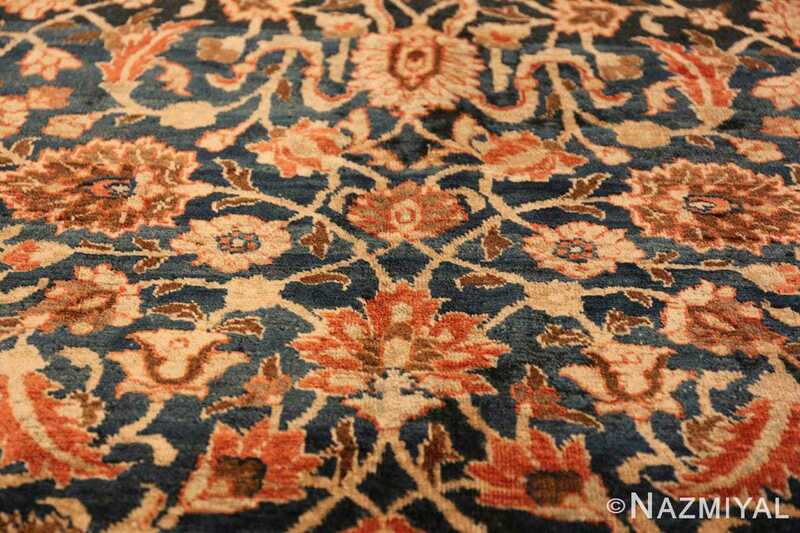 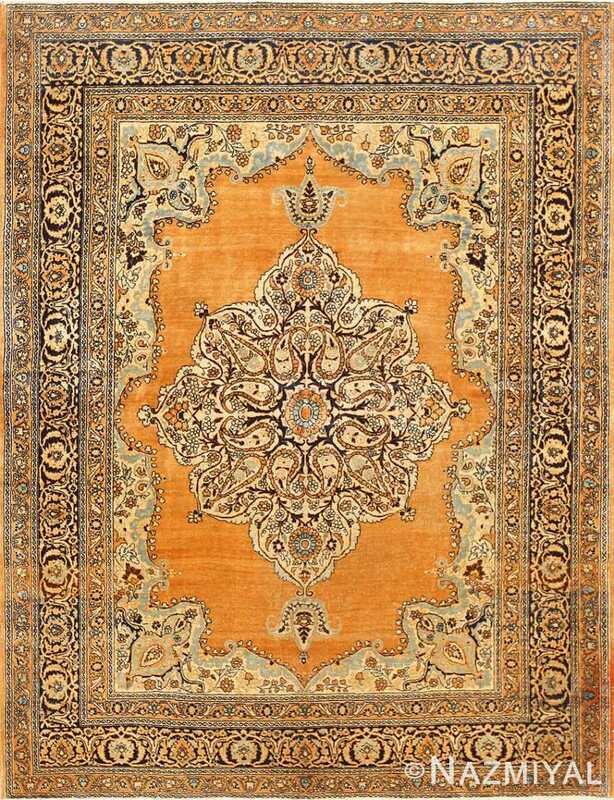 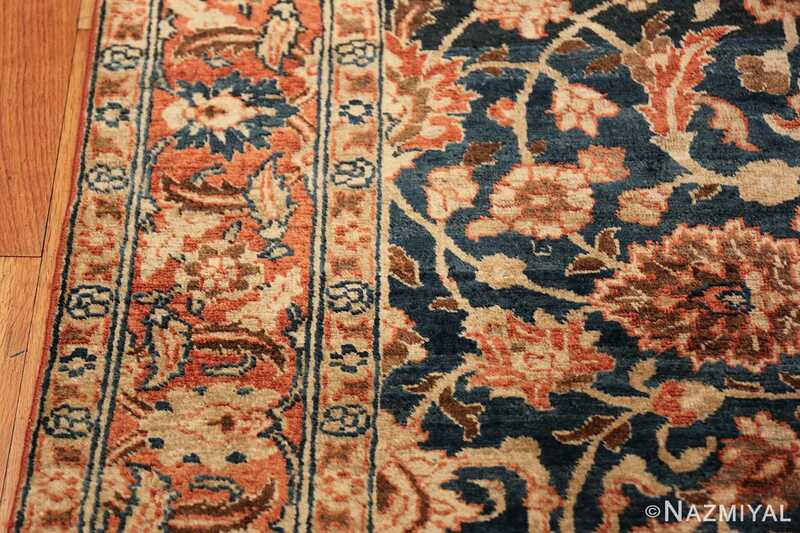 This splendorous antique rug is sure to add an exquisite flair of organic allure to any interior decor.